In my post on March 21st 2014 I wrote about an object I had found on the shore near Beckfoot, which one of my shore-walkers told me was a warp-weight or loom-stone; I subsequently saw similar objects used to keep the warp threads taut on a loom in the Dumfries Museum. But last week, I visited Mr Porter in Allonby who – when he was a lad – had helped his grandfather and father use fixed nets to catch herring from the shore, and has used a hand-net to catch brown shrimp all his life. 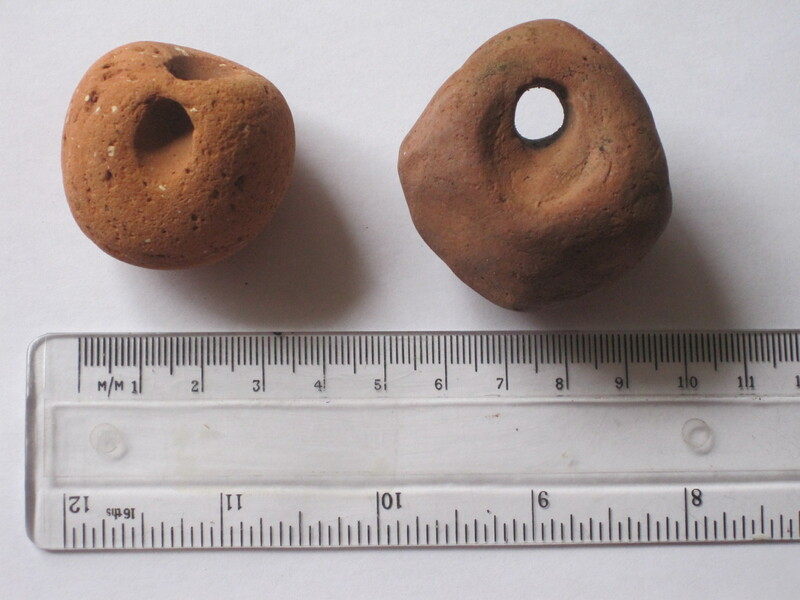 I’ll write more about the herring and shrimp fisheries later, but during Mr Porter’s wanderings on the shore he has found and collected a large number of red or yellow clay weights that are similar to mine (he gave me the one on the right in the picture; it weighs 65 gms). He is certain that the ‘stones’ were used to weigh down fishing nets that were – like the herring nets – anchored on the shore; his family’s nets were attached to an anchoring post and the bottom of the net was weighted with a line of lead weights while the top of the net floated free, buoyed up by corks. Once, after the big tides had uncovered a new scaur on the shore, he found a line of ‘about eight’ of these clay weights amongst the newly exposed rocks and pebbles – and one can easily imagine how they might once have been attached to a rope at the base of something like a gill net. 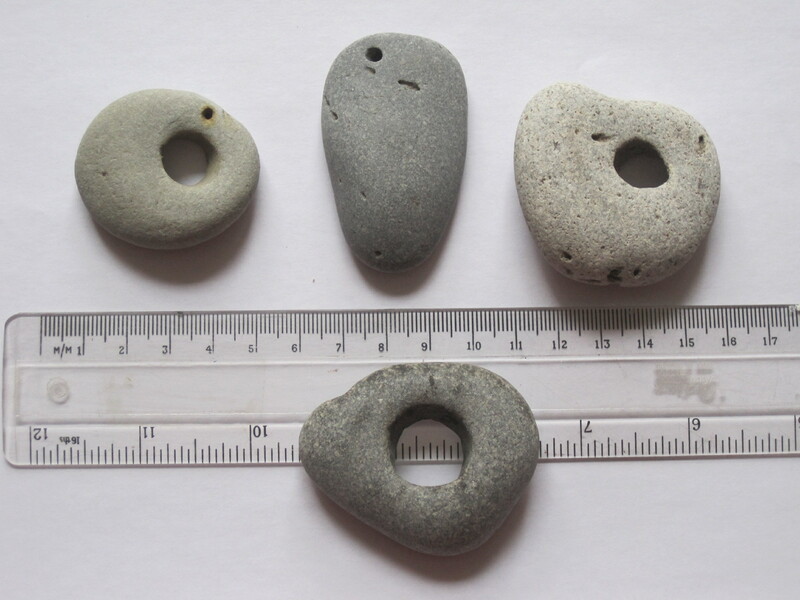 They could date from Roman times or earlier: the website for the British Museum’s ‘Portable Antiquities Scheme’ has several photos of similar fishing-weights found along the coast from Maryport to Beckfoot, dating from Neolithic through Roman to the Medieval period. Weights for warp threads or for fishing-nets? If you are going to the trouble of finding and then moulding clay into balls that are perforated by a hole, why use them for just one purpose? You can find stones like those in the photo on the Allonby shores, too. There are similar stones listed as probable fishing-weights on the BM’s site. Indeed, some could well have been used as fishing-weights, for humans are an adaptable and inventive species. But the holes are not man-made – they have been made by a bivalve mollusc, the Common Piddock, Pholas dactylus. The animal bores its way into a hard substrate, rotating its hard, ridges shells like an auger. As it grows, so it enlarges its burrow – but not its entrance, so it can never leave. This Piddock species has been found on various stretches of the British coast, where it ‘bores into a wide range of substrata including various soft rocks such as chalk and sandstone, clay, peat and very occasionally in waterlogged wood.’ The MarLin website also mentions the Solway as part of the Piddock’s range, and I can vouch for that fact as I have found burrows and shell remains in both the peat and some timber of the submerged forest. This entry was posted in shells, stones and tagged boring molluscs, fishing nets, fishing-weights, loom-stone, piddocks, Romans. Bookmark the permalink.